Yamaha Product Finder a Helpful Tool for Conferencing Products | Avcomm Solutions, Inc.
Are you trying to solve an echo problem? Trying to maximize security in your conferencing? 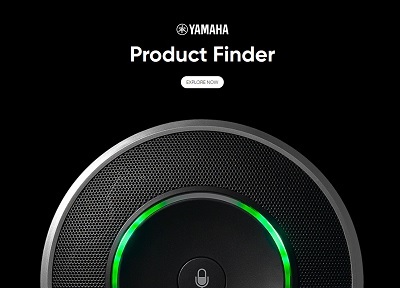 To answer customers' needs, Yamaha designed a new tool, the Conference Product Finder, to identify the right Yamaha Unified Communications product with ease. Answer a few questions, and immediately your recommendations pop up. Yamaha recognizes that conferencing needs are unique; even within one organization, there may be different connection types and room arrangements. A huddle room does not require the same type of coverage that a large board room would, for example. The first series of questions asks what you're trying to do: Enhance sound quality? Record voices? and other options. The next screen is about Compatibility: Bluetooth, VoIP, USB and Microsoft Skype for Business, or other UC platform? Next up, how many people does this system need to cover? It could be for as few as one person, and as many as 20+ people. Depending upon your answers, the product(s) that best match your requirements, will populate. The Product Finder will ensure the best fit for device and environment, connection type, and more; we will work with customers further on pricing, availability, and delivery status. Or, if you prefer to speak with someone directly, our staff will be happy to discuss the various conference products offered by Avcomm Solutions, and help you determine the best fit. Call us at 1-866-998-9991, or send an email.